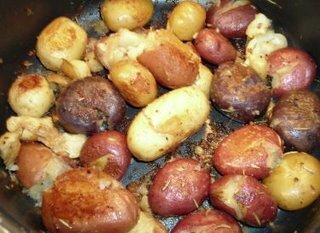 In a single layer, arrange all of the potatoes into the bottom of a large, nonstick pan. Add rosemary, salt (if needed), pepper broth, butter and oil. Bring to a boil. Reduce heat and partially cover with a lid. Continue to boil about 20 minutes. At this point the broth should have evaporated some but the potatoes should still be surrounded by broth up to the half way mark. Carefully use the back of a spoon to gently crack each of the potatoes, do not mash. Raise the heat slightly and continue to cook until all of the broth has evaporated and the potatoes have browned on the underside, about 10 minutes. Flip the potatoes and cook the other side for about 5 minutes. Remove from heat. Allow to sit about 2-3 minutes before removing the potatoes from the pan and serving. This is a modern version of the classic French dish pommes fondantes using baby potatoes instead of diced and broth instead of water. The potatoes get the most beautiful and creamy texture by cooking them this way. My husband insists that this would be an excellent "company dish" but I can't imagine wanting to share. We ate the entire pan between us and were fighting for the scraps. They are just that good.